co-workers paired with previously unheard tapes of Studs Terkel himself. them until they were interviewed by Studs. The Studs Terkel Program aired on 98.7 WFMT Chicago five days a week from 1952 – 1997. 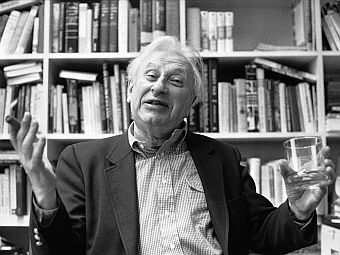 Our own Walter Parker interviewed Studs Terkel in 2005 to promote his book And They All Sang: Adventures of an Eclectic Disc Jockey. And after his passing in 2008, Commentator Bill Mares recalled his experience with the crackerjack interviewer and radio icon, Studs Terkel. We have remembrances from Vermonters who knew Senator Kennedy…former Governor Phil Hoff, former House Speaker Tim O’Connor, Congressman Peter Welch and Senator Bernie Sanders.